Abstract: Objective This study investigated the effect of tongxinluo (TXL) on high glucose-induced proliferation and apoptosis of cardiac fibroblasts (CFs), to explore the possible mechanism by which TXL inhibits myocardial fibrosis.Methods Primary culture and subculture of neonatal SD rat CFs was carried out as follows. 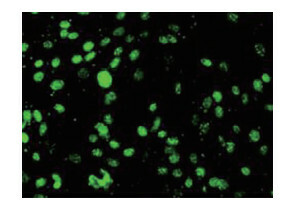 Immunofluorescence staining was performed to identify CFs. The CFs were divided into control group (cultured with low-glucose DMEM), model group (cultured with high-glucose DMEM), and TXL treatment groups (cultured with high-glucose DMEM+TXL at 20, 80, and 320 μg/mL). The proliferation of CFs in each group was detected by MTT assay. 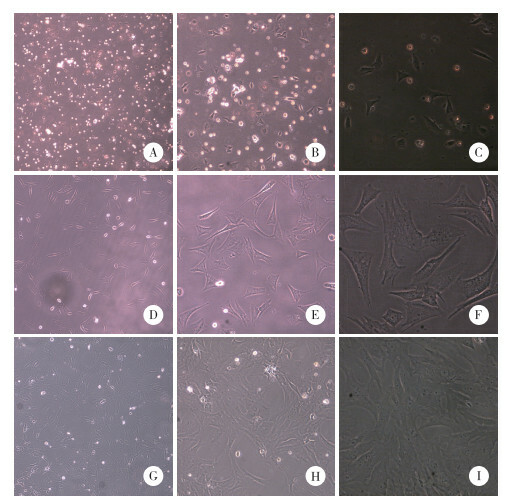 The expression of collagen types Ⅰ and Ⅲ in each group was detected by ELISA. Western blotting was used to detect the expression of bax and bcl-2 in each group.Results CFs Proliferation and collagen types Ⅰ and Ⅲ secretion were higher in the model group than in the control group. The CFs proliferation and collagen content in the TXL treatment groups were significantly lower than those in the model group. bcl-2 expression was significantly increased and bax expression was decreased in the model group, compared with the corresponding values in the control group. In comparison with the model group, bcl-2 expression was downregulated and bax expression was upregulated in the TXL treatment groups.Conclusion TXL can reduce the CFs proliferation and inhibit their collagen secretion under high glucose conditions. TXL also induces the CFs apoptosis by reducing bcl-2 expression and increasing bax expression. Thus, TXL can play a role in the treatment of myocardial fibrosis. 1) compared with the 6 h OD in each group, P < 0.05; 2) compared with the 12 h OD in each group, P < 0.05; 3) compared with the 24 h OD in each group, P < 0.05; 4) compared with the 48 h OD in each group, P < 0.05; 5) compared with the 72 h OD in each group, P < 0.05; 6) compared with the low glucose group at the same time point, P < 0.05. 1) compared with the control group, P < 0.05; 2) compared with the model group, P < 0.05; 3) compared with the 20 µg/mL TXL group, P < 0.05; 4) compared with the 80 µg/mL TXL group, P < 0.05; 5) compared with the 320 µg/mL TXL group, P < 0.05. Compared with control group, 1) P < 0.05; compared with model group, 2) P < 0.05; compared with 20 μg/mL TXL group, 3) P < 0.05; compared with 80 μg/mL TXL group, 4) P < 0.05; compared with 320 μg/mL TXL group, 5) P < 0.05. 朱晓丽, 王丽, 马依彤, 等. 乳鼠心肌细胞和心肌成纤维细胞体外分离培养方法的优化[J]. 中国动脉硬化杂志, 2015, 23(1): 90-93. 曾和松, 刘正湘, 马业新. 通心络抑制缺氧诱导的血管内皮细胞凋亡及机制研究[J]. 中国实验方剂学杂志, 2004, 10(3): 27-30. 王小梅, 穆长征, 杨颖婷, 等. 通心络对糖尿病大鼠心肌纤维化的防治作用[J]. 中国生化药物杂志, 2012, 33(5): 559-562.